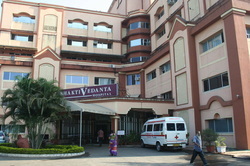 Bhaktivedanta Hospital is a unique medical facility in North Mumbai which has spiritual care at its core. The Spiritual Care Department at Bhaktivedanta is a dedicated team, that reaches out particularly to the patients and generally to all sections of society and helps them through spiritual approach. The department is based on the understanding that all types of ‘cure’ are inherently connected with the mental, emotional and spiritual healing. While treating the patients for all physical ailments, the mind is also provided comfort and emotional care. Susan is a visiting faculty at the spiritual care department training the staff and the nurses in empathetic approach towards patient care.